14 Salt Lake County festivals to check out this summer . . . Trans-Jordan leads countywide recycling initiative . . . . . . Three school districts in valley increase teacher pay, beneﬁts Multitalented Adams en route to be Ute . . . . . . . . . . . . .
May the Fourth Be with You — a Viridian tradition By Natalie Conforto | natalie.c@mycityjournals.com The Cottonwood-Holladay City Journal is a monthly publication distributed directly to residents via the USPS as well as locations throughout Cottonwood and Holladay. For information about distribution please email circulation@mycityjournals.com or call our ofﬁces. Rack locations are also available on our website. 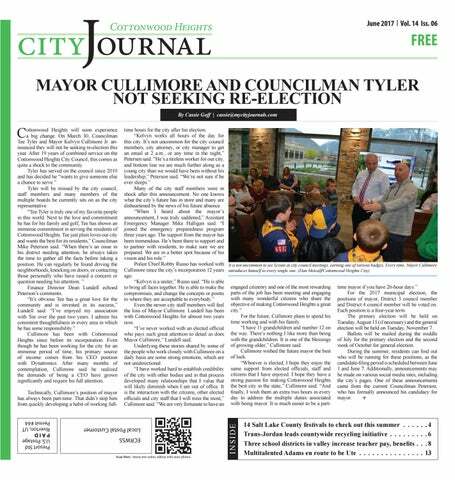 For subscriptions please contact: circulation@mycityjournals.com The views and opinions expressed in display advertisements do not necessarily reﬂect or represent the views and opinions held by Loyal Perch Media or the City Journals. This publication may not be reproduced in whole or in part without the express written consent of the owner. Simple cleaning only for uninsured new patients. Not valid for those with discount plans or other program offers. Not valid with other offers. offers. Expires 6/30/17. 1/31/17. offers. Not Not valid valid for for those those with with discount discount plans plans or or other other program program off ers. Not valid with other off ers. Expires offers. Not valid with other offers. Expires 1/31/17 6/30/17..
t’s summertime, and that means Salt Lake County cities are gearing up for their biggest celebrations of the year. From Draper Days to West Valley’s WestFest, here’s a chronological list of festivals to help you get your sun days on. activities. Held at Centennial Park, 5415 W. 3100 S., WestFest will offer multicultural entertainment, international cuisine and artisans, crafters, and hobbyist booths from many demographics. A carnival, movie under the stars, West Valley Symphony concert, police K-9 demonstration and ﬁrework demonstration are also part of the schedule. Visit westfest.org for speciﬁc dates and times of each event. on July 1, 3 and 4 at the rodeo arena located at 8035 S. 2200 W. Other recurring events throughout the stampede include a carnival and photo scavenger hunt at Veterans Memorial Park, 8030 S. 1825 W. The Independence Day celebration will also include a parade at 10:30 a.m., pie-eating contest at 1 p.m., band concert at 1:30 p.m., movie in the park at dusk and a ﬁrework ﬁnale at 10 p.m. For a full and up-to-date list of activities, visit westernstampede.com. Fun Days | July 4 Murray City’s 58th annual Fun Days celebration at the Murray Park, 296 E. Murray Park Ave., offers Salt Lake County residents with yet another set of Independence Day activity options. The day will start out with a sunrise service and will end with community members looking into the sky once again for a ﬁrework display. In the middle of those two bookends, the city will offer a breakfast, a 5K race, a children’s race, a parade, games and a talent show. Visit murray. utah.gov for more info. July 4th Parade and Festival | July 4 South Salt Lake residents and others will gather at Fitts Park, 3050 S. 500 E., on Independence Day for a patriotic celebration. A fun run kicks off the day’s activities at 8 a.m., followed by a parade at 9:30 a.m. and a festival from 11 a.m. to 2 p.m. Check southsaltlakecity.com for more information. Sandy City 4th of July | July 4 This one-day celebration consists of vendors and a parade. Details are still being worked out. Visit sandy.utah.gov mid-June when more information becomes available. Draper Days | July 6–8, 11–15 Traditions like the Draper Days Rodeo, Draper Idol, a children’s parade, the Heritage Banquet, movies at the amphitheater and the Draper Days Parade are almost here. The eight-day Draper Days festivities tout activities for people of all ages, and even dogs. A Splash Dogs jumping competition will hit the Draper City Park (12450 S. 1300 E.) on July 14 and 15. Human competitions, like a strider bike race, three-on-three basketball tournament and 5K race, will also take place. Check out a full list of activities at draperdays.org. Butlerville Days | July 21–22 Cottonwood Heights’ website boast about its Butlerville Days, named after the Butler family who originally settled the area, saying it will have the “most mouth-watering fare you can imagine” and “the best ﬁrework show in the Salt Lake Valley.” Don’t believe it? Head over to Butler Park to ﬁnd out. The festival will also have a carnival, chalk art festival, free bingo and the Mayor’s Cup Pickleball Tournament. More info can be found at cottonwoodheights.utah.gov. 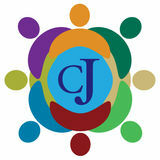 C OTTONWOOD H EIGHTS JOURNAL .COM for residents to be aware of. The do-not recycle items listed are the most important and most misunderstood: plastic bags, glass and Styrofoam, Earl said. “It keeps it simple — they can just focus on what to do, rather than memorizing do this, don’t do this,” she said. Every month, the group and all cities involved will release an article about one of the 10 contaminants, and give other options for what residents can do with those materials, rather than recycle or even trash them. Draper City Draper City sent out a graphic in their bimonthly newsletter sharing the dos and don’ts outlined by the recycling campaign, with the hopes that residents would cut it out and tape it to the inside of their recycling can lid as a reminder. Along with the graphic is a schedule of when and where residents can get rid of hazardous wastes throughout the summer, which will be coordinated by the county, like the glass-recycling location behind the Draper Public Works facility at 72 E. Sigovah Ct. (14525 S.). Hazardous materials can also be taken to Trans-Jordan. Draper City’s involvement came ﬁrst from their Trans-Jordan afﬁliation, but also from the desire to share recycling guidelines with residents that they could trust because it is often unclear, said Maridene Alexander, the city’s public information ofﬁcer. “I think we all want to be very good stewards of our environment. Once we know what we can put in our container people will do that,” Alexander said. “We appreciate what TransJordan is doing and all the information they’ve put together and we just want to add our information to it as well, and make sure we are all sending out the correct information.” Those at Trans-Jordan and cities across the valley don’t expect immediate change, but are hoping the contamination rate will decline in consistent ways as they work to continually educate residents, Earl said. campaign. “We’re trying to empower residents to make these choices so that residents feel that they know what they need to do. If they have information from us, either at the county level or from TransJordan, that says what is the right way to do things, they will be incentivized to recycle the right things and they will recycle more material because they know what they should and should not put in that system,” she said. Olympus Family Medicine is excited to introduce Dr. Kristen Romo. She is a Board Certified Family Practice Physician specializing in adolescent medicine and women’s health. She is also fluent in the Spanish language. Dr. Romo believes that open communication is the key to providing exceptional health care and it is her mission to provide that to a diverse patient population. In her years of practice with the University of Utah Health Care, she has had the opportunity to participate and lead in quality improvement projects focusing on chronic illnesses and preventative care. Dr. Romo is an Illinois native and currently resides in Holladay with her husband, two children and dog, Loki. She enjoys Pilates, spending time with family, snowboarding, hiking and mountain biking. Dr. Romo brings fresh enthusiasm and proven experience to Olympus Family Medicine and looks forward to serving you. Injury Assessments CALL NOW for information about our acceleration programs for athletes. Clinics in Midvale and Sandy. We Fix Your BENDS and BREAKS We Treat the Team and the Fans At Salt Lake Regional Medical Center, patients know they can count on the dedicated orthopedic surgeons, physicians, nurses and physical therapists no matter what bone or joint problems they face. Make an appointment at one of our two convenient locations in Midvale and Sandy. Our Athletic-Based Training system and sports medicine services are designed for youth and adult athletes of all skill levels with training programs led by professional Speed/ Strength Coaches, inside a NEW high-energy facility. Limit 1 per customer. Tax not included. Expires 6/30/17. With doctors ranging from Olympic gold medalist to former ﬁreﬁghters and US Air Force ﬂight surgeons, our physicians know how to get you moving again. We provide gold medal treatment and cover you from sports medicine to total joint care. nce again, folks in Cottonwood Heights have prepared for the big one—the big earthquake that is predicted to occur sometime in the future, that is. Every year, the city hosts the Great ShakeOut, where the emergency preparedness team, under the supervision of Assistant Emergency Manager Mike Halligan, runs residents through emergency procedures during a mock earthquake. This year it was held on Saturday, April 22. The event also included sandbagging in preparation for spring ﬂooding. Months before the event, local Scout troops compiled sets of triage ribbons for residents within the city. On the morning of the ShakeOut, residents were encouraged to participate with their ribbons, placing an appropriate ribbon outside of their homes so the block captains could practice surveying, in preparation for a real emergency event. The majority of ShakeOut operations were staged at the Cottonwood Heights Recreation Center, located at 7500 S. 2700 E., from 9:30 a.m. to noon. A simulated shelter, with ﬁrst-aid and medical equipment, was provided by volunteers of the Utah Region Red Cross. The Cottonwood Heights Amateur Radio Club was in charge of all communications and ran through numerous exercises. A reception center was also manned. Cottonwood Heights City Hall, located at 2277 Bengal Blvd., staged additional operations, which included an emergency operations center and pet shelter—a new feature this year. Cottonwood Heights partnered with Sandy City, Murray City, Cottonwood Heights Police, and the Uniﬁed Fire Authority (UFA), speciﬁcally Station No. 116 located within the city, for the ShakeOut Event. of the golf swing.” The coach’s golf experience includes working as a PGA Tour rep for Callaway Golf, managing the PGA Tour’s Utah Championship in Salt Lake City and running a major championship on NBC Sports called JELD-WEN. way or another,” said Byers. “I guess my impact is teaching them the great game of golf and all it stands for. I’ve enjoyed that part of it.” “I’m very blessed to get this opportunity to coach these girls,” Byers said. “This is a gift. with couple’s therapy and its improvement on natural conception. With all the success that Reproductive Care Center has achieved, it hasn’t always come easy. This could be your new bathroom in just 1 day! 16 PLAYERS. 50 YARD FIELD. 60 MINUTE CLOCK. 10,856 COACHES. THE 1ST PRO TEAM WHERE CALL THE PLAYS HAS ARRIVED IN UTAH. For City Journals Exclusive Home Ticket Offer Contact: Kevin@slseagles.com LIMITED TICKET AVAILABILITY ... BOOK YOUR SEATS TODAY! Walk Right Into a Safer, Sleeker Space! We offer no-stress, no-mess bathroom upgrades at an affordable price. Give us ONE DAY and we’ll give you a NEW and beautiful shower with luxurious ﬁxtures, all in your choice of colors and styles. Ask about our easy and convenient NO-COST 100% Financing! Call us today or visit our showroom. ave you noticed all the bucket list articles lately? I don’t know what it is, but all of a sudden, I’ve seen article after article about sky diving over Dubai, riding a camel in the Sahara Desert, or cycling though South African vineyards on a carbon negative tour. I was wondering, if perhaps, I missed a sale on buckets at my local bucket store or maybe it was “national buy a bucket day” last week and everyone but me stocked up on buckets. And now to get some use of them, they are stufﬁng them up with dreams and lofty visions of travel grandeur. Being a self-proclaimed master planner, this all should be well and good to me. Besides, who am I to tell folks how to use their buckets? But it seems to me that creating a fantasy travel dreamland could end up in a wide-awake letdown when you hit the road. So, in keeping in the spirit of adventurous travel, here are some ideas to keep your dream bucket a reality. Understand your Travel Fund: Part of making travel a reality is to make a budget. Figure out your travel style. Are you a higher maintenance traveler that needs pricier hotels and to be entertained or does camping at a beach or hiking through the mountains meet your needs? No matter which kind of traveler you are and what your ﬁnancial situation is, you’ll want to make sure to allow extra money for spontaneity and little luxuries. A general rule for us has been to plan for the vacation to cost 15 to 25% more than we think. ordes of families will go to Disneyland this summer because parents continue to be stupid. Touted as “The Happiest Place on Earth,” its creators have obviously never been on the Tequila Tour in Cancun. Parents announce “We’re going to Disneyland!” and because kids have no sense of perspective they’ll ask hundreds of times when you’re leaving. You’ll consider canceling the trip to avoid spending any more time with your adorable screeching goblins. Whether you ﬂy (unwise) or drive (equally unwise), the trip to California is never part of the fun. When we took our kids to Disneyland in a covered wagon, they didn’t have iPads to entertain them. Instead, it was 10 hours of whining until my kids ﬁnally told me to shut up. Once you ﬁnd your motel (which is ten times as dumpy as it looked online) and gently scoot the homeless lady out of the doorway, your kids can run to the outdoor pool to contract cholera while you unpack the car. The night before your ﬁrst day in Disneyland, no one sleeps. Not because everyone’s excited but because your 5-year-old is crying because she’s afraid of clowns. Even though there are no clowns in the area. And you haven’t discussed clowns. And you can’t convince her she won’t be chased by clowns. So you arrive at the Happiest Place on Earth with everyone scowling. FedEx . UPS . US Postal Service . DHL Packaging and Shipping Experts SHIPPING WORLDWIDE GET A FREE BOX with SHIPPING! If you forked out extra money to eat breakfast with fairies (suckers), you’ll discover everyone else in the universe has done the same thing. Your breakfast with fairies turns into breakfast with someone who might be a fairy but you’re too far away to tell. Turning on your we’re-going-to-have-fun-atall-costs voice, you’ll exclaim, “Who’s ready for some rides? !” and wander into Disneyland (henceforth called the Park—like Madonna, Cher and God). Everyone wants to go in different directions which begins the ﬁrst of several ﬁstﬁghts. You must have a plan to tackle the Park. Hopefully, this eliminates the identical rides where you sit in a little car that takes you through a colorful re-enactment of classic Disney cartoons. (Keep saying “Wow!” until you’re convinced everyone’s having fun.) Random Disney villains will walk through the Park to excite/terrify your child. Seeing Maleﬁcient striding toward her, your 5-year-old will scream and hide behind a garbage can, crying until she passes by. For meals, there are a variety of food options. But instead of purchasing food in the Park, take a ﬂight home for meals. It will be cheaper. At some point, a random clown will walk by, throwing your 5-yearold into hysterics.